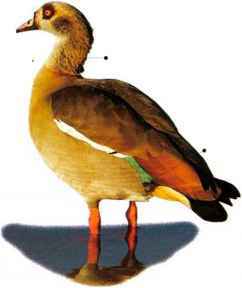 I his bird lives in marshes, lakes, and rivers, where it sometimes swims and dives, but it is more.usually seen on land. It grazes on grass also eating leaves and seeds of plants including crops, and possibly occasional insects. 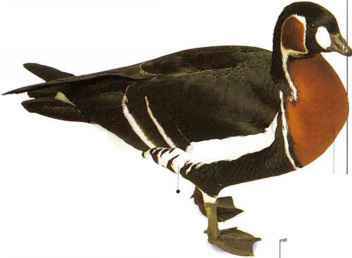 The female can be distinguished by her trumpetlike quacking, in contrast with the male's soft, husky calls. Pairs mate for life, forming flocks after breeding that perch and roost in trees. • NEST A hollow in the ground under vegetation, or a hole in a cliff, cave, or tree. • DISTRIBUTION I Ipper Nile Valley and Africa south of the Sahara; introduced in England. • REMARK Although it is called a goose, this bird is really a species of shelduck.